The Hunting Art Prize, which is sponsored by the international oil services company Hunting PLC, is a Texas-wide competition open to established artists, talented newcomers and promising amateurs. The $50,000 award is the most generous annual art prize given in North America for painting and drawing. The competition is open to Texas-based artists who are 18 years of age (as of August 1, 2010) or older. Artwork submitted for consideration must be a single two-dimensional painting or drawing no larger than 72″ on any one side (including frame, if any). Artists must sign up using the electronic form at www.huntingartprize.com and upload one digital file representing their selected artwork. The digital file must be in JPEG format and no less than 1MB and no more than 3MB. 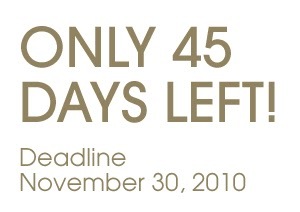 All entries must be submitted no later than midnight, Tuesday, November 30, 2010. Email us at info@huntingartprize.com. For further details on submission criteria, terms and conditions, visit www.huntingartprize.com. Hunting PLC is an international oil services company providing solutions to the world’s largest oil and gas concerns. Established in 1874, it is a fully listed public company traded on the London Stock Exchange. For further information, visit www.hunting.plc.uk/.